Cast on a multiple of 22 stitches. Round 1: *Knit 10, purl 10, repeat from *. Round 2: *Purl 1, knit 9, purl 9, knit 1, repeat from *. Round 3: *Purl 2, knit 8, purl 8, knit 2, repeat from *. Round 4: *Purl 3, knit 7, purl 7, knit 3, repeat from *. Round 5: *Purl 4, knit 6, purl 6, knit 4, repeat from *. Round 6: *Purl 5, knit 5, repeat from *. Round 7: *Purl 6, knit 4, purl 4, knit 6, repeat from *. Round 8: *Purl 7, knit 3, purl 3, knit 7, repeat from *. Round 9: *Purl 8, knit 2, purl 2, knit 8, repeat from *. Round 10: *Purl 9, knit 1, purl 1, knit 9, repeat from *. 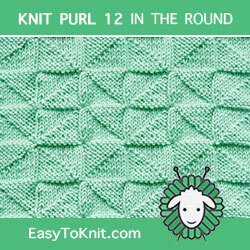 Round 11: *Purl 10, knit 10, repeat from *. 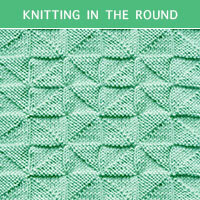 Round 12: *Knit 10, purl 10, repeat from *. Round 13: *Knit 9, purl 1, knit 1, purl 9, repeat from *. Round 14: *Knit 8, purl 2, knit 2, purl 8, repeat from *. Round 15: *Knit 7, purl 3, knit 3, purl 7, repeat from *. Round 16: *Knit 6, purl 4, knit 4, purl 6, repeat from *. Round 17: *Knit 5, purl 5, repeat from *. Round 18: *Knit 4, purl 6, knit 6, purl 4, repeat from *. Round 19: *Knit 3, purl 7, knit 7, purl 3, repeat from *. Round 20: *Knit 2, purl 8, knit 8, purl 2, repeat from *. Round 21: *Knit 1, purl 9, knit 9, purl 1, repeat from *. 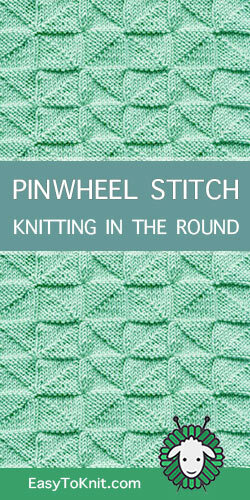 Round 22: *Purl 10, knit 10, repeat from *.